If you’re looking to celebrate Valentine’s Day with your special someone, I’ve found a romantically-charged play, about letters exchanged between two people over 50 years; as well as a chocolate-and-wine-paring dinner in an aquatic setting – both taking place on our island’s picturesque eastern end – that couldn’t help but melt a few hearts! “Love Letters,” Feb. 8-10 and Feb. 15-17. Levitas Center for the Arts, 22 Pond Lane, Southampton. Written by A.R. Gurney, this play follows childhood friends Andrew Makepeace Ladd III and Melissa Gardner who write letters to each other over the course of 50 years. What begins as birthday party thank-you notes transforms into romantically-charged letters that discuss life lessons, loves and separations. Tickets can be purchased online, on the phone and at the door. Fridays and Saturdays, 7 p.m.; Sundays, 2:30 p.m. Details: 631-287-4377. scc-arts.org. ChocoVino, Feb. 14. Long Island Aquarium, 431 E. Main St., Riverhead. Set against stunning hues of the aquarium’s aquatic tanks at the aquarium, a five-course, chocolate-and-wine-pairing experience is offered, with each course incorporating a taste of chocolate and paired with a specific Rafael Vineyards vintage wine. Both traditional and vegetarian menus are available, with delicious options like Confit Portobello Mushroom with chocolate biscotti, raspberry vinegar glaze and dried raspberries; and Cocoa Nib Dusted Filet Mignon with Chocolate Steak Sauce. 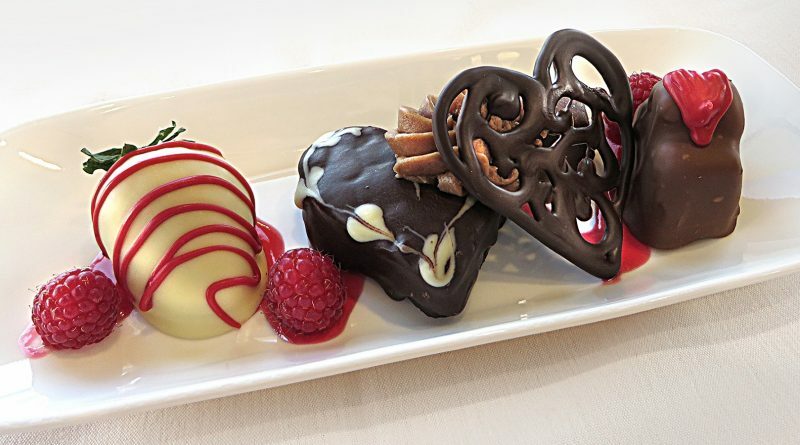 Cap off your evening with a Heavenly Chocolate Trio, comprised of a linzer tart dipped in white chocolate, a dark chocolate-covered cream puff and milk chocolate salted caramel. Hours: 7:30-10:30 p.m. To reserve, call 631-208-9200, ext. 426. longislandaquarium.com.